The UL listed Eaton 3G Metro Power Solutions are ideal for low to medium power telecommunications applications requiring compact, efficient and flexible DC power. Typical applications include standby DC power for customer premises equipment, outdoor shelters, VoIP, PABX, data networks and IP routers. 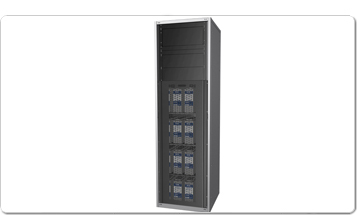 The Extension Battery Cabinet allows customers to easily configure and install additional battery back-up time for critical telecom and IT equipment. Up to six Extension Battery Cabinets can be installed in addition to the DV2-3G Metro cabinet. This gives a total battery capacity of up to 4200Ahr in 48Vdc solutions, or 8400Ahr in 24Vdc solutions. The Extension Battery Cabinet can be fitted with an optional DC Distribution, extending the number of output circuits available from the power cabinet. These distributions utilise easy fit, plug-in hydraulic-magnetic breakers.